You'll go on incredible adventures in the 2019 Coachmen Catalina Legacy Edition 333RETS Travel Trailer! National RV Detroit in Belleville has been selling all the great, top brand RVs from all the leading manufacturers since 2008! As a top, full-service dealership in southeastern Michigan, we're committed to helping you find your dream RV at a dream price! We're conveniently located at 44700 N I 94 Service Dr Belleville Michigan 48111, so stop in and talk to us today. You'll be amazed at the deal we can create just for you! If you don't live in the Belleville area, don't worry! We offer personalized phone and internet service along with 24/7 delivery throughout North America, so we can still help you find your perfect RV and have it at your door in no time! It's never been easier to own the RV of your dreams, so stop in today or call us at 734-439-3400! What's really nice about this Travel Trailer is how easy it is to hook up and hit the road! It's got a hitch weight of 1106 lbs. and a GVWR of 10500 lbs, so it's ready to go! Set up is effortless too, and the 14' 0" patio awning opens easily so you can enjoy shade and protection for outdoor lounging! The Catalina Legacy Edition 333RETS is built for comfortable living on the road for you and your whole family! It's 35' 10" long, 8' 0" wide, 11' 1" high and has 3 slides to maximize the interior living space! And with its modern 13500 BTU a/c unit and efficient 35000 BTU furnace, you'll keep the climate in your Travel Trailer perfectly comfortable whether it's sizzling outside or freezing! You can enjoy clean drinking water and not load up a landfill with empty plastic water bottles, thanks to the 46 gallon fresh water tank! The roomy kitchen has a sink, 7.00 cu. ft. refrigerator, 3 burner range cooktop, and other great amenities! Even after days on the campground, you can enjoy a hot shower thanks to the heat provided by 40 lbs. of LP tank capacity! The bathroom has a convenient Marine Foot Flush toilet, and dirty water is sent to the 40 gallon gray water tank and the 30 gallon black water tank. 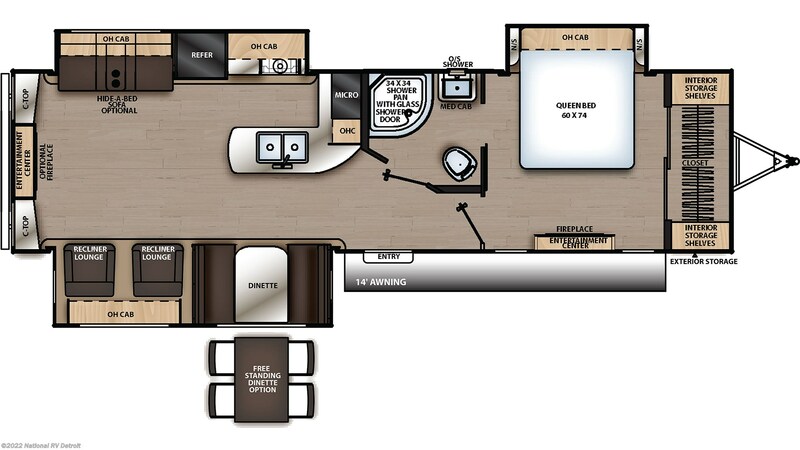 Check out Stock # 6675 - 2019 Coachmen Catalina Legacy Edition 333RETS on coachmenrvsource.com!